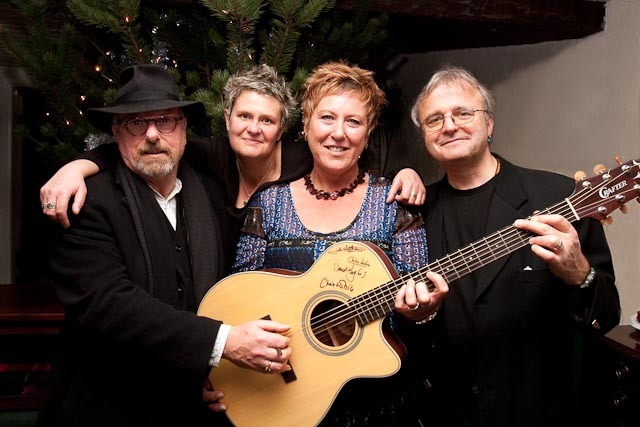 The traditional start to the Christmas festivities featuring Chris While Julie Matthews, Chris Leslie and David Hughes is always uplifting and fun – not to be missed. St Agnes Fountain are about to embark on their 14th consecutive sell-out Christmas tour. Since their first get together, to record the eponymous St Agnes Fountain album in 2001, the quartet of founder, David Hughes; Fairport Convention’s Chris Leslie and 2009’s BBC Radio 2 Folk Awards Best Duo, Chris While and Julie Matthews, have brought musical invention and laughter to the star-dust atmosphere of the season. “The Aggies” recorded their 8th album (12 years of Christmas) in 2012 again combining new versions of classic Christmas carols, original compositions and one or two fun surprises. Although the albums accompany the putting up of a thousand Christmas trees throughout Britain, it is, without question, their magical live performances that have endeared them to an ever-growing audience (tickets were again being sold for this year’s tour as the curtain fell last year). They hope to bring you, this December in their thirteenth year, more of their sparkling musicianship, humour and heartful renditions of your favourite Christmas tunes both original and those you know so well (or thought you did).